Southern Dharma is dedicated to promoting human flourishing. Our Vision is to support those who seek wisdom, compassion, and awakening through direct experiences that lead to a transformation of heart and mind for the benefit of all beings. Working at Southern Dharma is a gift to be treasured and it can be challenging to live so intimately with others and work in such isolation from civilization. Staff benefits include some medical coverage, a monthly salary, two weeks of vacation, housing, food and the opportunity to sit in on retreats. Staff support one another along the Path through spiritual community and friendship, operate and maintain the Center, provide for guests, and conduct retreats. Southern Dharma Retreat Center is a rural mountainous retreat center, where staff and volunteers live and work together. If you are interested in applying for staff, we ask you to volunteer for at least one retreat and attend a retreat prior to consideration, so that we can get to know one another. Please contact us for more information. Under the direction of the Director and in cooperation with other SDRC staff, the Kitchen Manager at Southern Dharma Retreat Center (SDRC) plans and prepares two vegan meals daily for buffet-style service to 25-35 people attending scheduled retreats and board meetings (approximately 270 meals/year). Duties include planning menus, preparing and serving meals, managing an approved budget, maintaining inventory, shopping for food, maintaining safe and sanitary work practices and conditions, ensuring proper food handling and storage, equipping and operating the kitchen, and supervising volunteers. One of a small essential full-time staff team, the Kitchen Manager lives, works and participates as a member of SDRC’s spiritually driven community, embracing the culture and mission of the center. Additionally, the Kitchen Manager maintains a personal meditation practice and participates fully in community sit and sharing in accordance with the center’s Buddhist traditions. Experience using standard kitchen equipment and preparing basic food. Experience cooking in restaurant, cafeteria, catering, food truck or farm to table experience. Operational knowledge of a wide variety of F.S. equipment and practices. Excellent organizational, time-management, and communication skills with ability to plan, coordinate, and meet strict deadlines, shift tasks and prioritize multiple tasks. Ability to organize, teach, and supervise as many as five volunteers simultaneously. Ability to function effectively under pressure and to solve problems with minimal supervision. Responsible for compliance with all health and sanitation codes, providing overall quality assurance in the kitchen while ensuring culinary excellence at all times. Actively participates in Intentional Community, Staff Development, Staff Meetings, Check-Ins, Practice Periods and Fundraising initiative(s). Invoice/order management, provides accurate wholesale and retail receipts with separate sales tax. Attitude and ability to work in a highly flexible, rapidly changing work environment. Analyze guest and peer feedback and provide strategic direction to continuously improve satisfaction. Observes and participates in the hiring and selection of staff, submits self and peer performance evaluations and recommendations as a member of the Staff Community. Operate within budget and provide accurate data and timely completion of all reporting activities. Work cooperatively with the peer team & Director to ensure seamless operation of retreat. Ensure procedures, and standards are being followed. Provides input to improve process, as needed. Performs all other duties as assigned or requested. Willingness to work weekends and 7-10 days in a row during the retreat season. Willingness to work, live and participate in a community of five full time staff, multiple resident volunteers and many retreat guests. Willingness to have varied days off. Must be willing to commit to an initial 1 year contract. Must possess a valid, US state issued driver's license, a good to excellent driving record. Must obtain a NC driver’s license within 30 days of employment. Must have a commitment to a personal daily meditative/contemplative practice. Willingness and intention to practice together in community. Disclaimer: The information provided in this job description has been designed to indicate the general nature and level of the work performed by incumbents within this job. It is not designed to be interpreted as a comprehensive inventory of the position. The Director, in consultation with the Board of Directors, has the sole discretion to add or modify duties of the job at the time. This job description is not an employment contract. Salary commensurate with experience plus room, board and benefits package including health insurance. Resumes Accepted Until position filled. No Phone Calls. The Practice Community at Southern Dharma is a non-sectarian, intentional sangha or practice community where individuals with a long-standing spiritual practice can live, retreat, study, and meditate with the support of others. Members of the community commit to gather at least four times each year, sitting twice daily when in residence together. The Practice Community is located adjacent to Southern Dharma Retreat Center and reflects Southern Dharma's founding purpose in that Practice Community members share Southern Dharma's respect for all spiritual traditions and desire to live in harmony with others and with nature. The Practice Community is owned and governed by its members who work with the Board of Directors of Southern Dharma to establish guidelines for co-existence and mutual support, with a goal to support and strengthen Southern Dharma as a non-sectarian center practicing tolerance and respect for all spiritual traditions. The Practice Community currently consists of eight "holdings" that are divided into three clusters along the Dharma Path road on which the holdings are located. The word "holding" is the term used to describe the property that members of the Practice Community personally own. Each holding consists of a cabin with its surrounding land and an equal share in a Limited Liability Company (LLC). The LLC in turn owns a 72.5 acre tract of land adjacent to Southern Dharma as well as a community building used for meditation, meetings, shared meals, and laundry. One holding is currently available for purchase, and additional holdings may be available in the future. 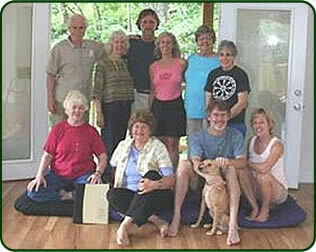 Members of the Practice Community desire to live simply and quietly in community either part time or full time. If you are interested in learning more about the Practice Community—or if you would like to explore the possibilities of a cabin rental for your own private retreat—please contact community member Peggy DeBell by phone at 828-275-4141 or by email at debellp@aol.com. We were transplants from the southeast, living and studying in San Francisco: I was learning the Iyengar method of hatha yoga instruction; Melinda Guyol was working towards a Master's degree in psychology and counseling. It was a time when spiritual truths seemed very real, and the human heart and mind capable of wondrous things. By 1978 I'd been in California for ten years, two to three in San Francisco at The Yoga Institute where, as a student, I helped start Yoga Journal magazine, assembling the first issues in someone's garage! By June of 1978, however, I found myself feeling the need to do something new; I was feeling a bit like a well-used sponge, soaking up ideas and squeezing them out again and again... for papers, tests and articles for the magazine. Rather suddenly, I wanted to leave California and find work "someplace in the Southeast" where I had spent the first years of my life. I was then forty-one. I relayed these feelings to my friend Melinda, who had lived in the Bay Area since the age of fifteen, but had been born in Knoxville. At 37, she was intrigued by the idea of returning to and exploring the region of her birth. So, in the summer of 1978, steeped in the spiritual idealism of the California seventies, we set out to find a niche for ourselves in the South. The idea of a retreat center had often been tossed around with friends at dinner parties, and the name "Southern Dharma" had popped into my head one day as I was walking down the stairs of the house where I lived in San Francisco. But Southern Dharma was not by any means a well-defined vision when we embarked upon an exploratory trip to see where and what we could do. Opening a bookstore had been one of our many ideas, so we set out to visit a number of southern cities, to figure out which needed a bookstore, then to decide whether or not we wanted to live there. We visited friends and explored the need for bookstores in Pensacola, Birmingham, Atlanta, Savannah, Charlotte, Charleston, Columbia, Asheville, Greensboro, Durham, Raleigh, and Chapel Hill. Twelve cites and two months later, the sight of another bookstore began to make us feel slightly ill; plus we realized that every city we visited seemed to be amply blessed with booksellers. Most distressing, however, was the heat! It was hot in the Southeast, hot as a furnace everywhere we went — everywhere, that is, except in the mountains around Asheville, North Carolina, where we stayed at the Inn of Hot Springs. So, we returned to the idea of a retreat center... a small retreat center somewhere in the cool mountains. At this point I wish I could say that one of us had a vision or heard voices directing us what to do next, but there was nothing so mystical about Southern Dharma's beginnings. We were simply two women looking for our destinies and hoping to find them someplace where it didn't get too hot. We both wanted to work at something we believed in, something we felt was worthwhile and needed, and it seemed to us, in our own search for meaning, that few things were more needed than to uncover the intrinsic purity that we felt could be found at the center of the human heart. Providing a supportive environment and teachers to encourage such work seemed to us a worthwhile endeavor. We returned to California and spent the better part of the next three months defining our vision, writing down ideas, examining our own motives and resources and goals, talking to more people, and finally enlisting the service of a lawyer with experience in setting up non-profit foundations. On December 7, 1978, the Southern Dharma Foundation became a legal entity, initially a foundation, later a public charity, after it gained wider support. The winter of 1978/79 found us back at the Inn of Hot Springs in very beautiful, very rural Madison County, riding around with real estate people, looking at the winter landscape, and falling in love with a different piece of property each time we went out. We looked at about twenty places before finding the one that met our increasingly refined criteria: rugged, remote, the sound of rushing water, a sunny exposure. The 140-acre farm on Hap Mountain in Spring Creek had it all — fields, forests, and ferns — everything that makes the mountains so alluring. The one thing it lacked was good access. 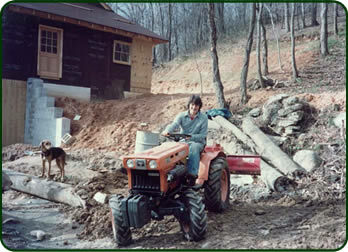 By late spring of 1979 we began a five-year frenzy of clearing land, building new buildings, remodeling old buildings, and "dressing up" (as our real estate man called it) the old logging road that led into the property. Making the road, or, more accurately in the beginning, the trail negotiable by any American automobile at the time required what today might be termed an extreme makeover. But those early days were a wonderful, energetic time of learning hundreds of new things: how to build from the ground up, how to put in a road and take care of it, how to capture a spring and build a stone wall. There were new and marvelous tools to learn about: chainsaws and table saws, planers and sanders, routers and lathes. We discovered the joy of bib overalls and LL Bean boots, watched our city cats become country cats, and raised a delightful black-and-tan hound dog we named Emma. There were tears and laughter and arguments and difficult decisions, and the satisfying feeling of good, hard work. At the end of those five formative years, there nestled in an upper valley of Hap Mountain a remodeled farmhouse with an expansive back deck; a workshop with a bedroom loft; a shored-up barn with a new extension; a tiny 9'x14' cabin, begun 75 or 80 years before which we finished with windows and a door and labeled "The Shack" along with a meditation hall large enough to accommodate 40 sitters; a 3,600 square-foot dorm playfully nicknamed the "dharmatory", and, finally, a new retreat cabin made out of 100-year-old chestnut beams and other "leftover" materials. Southern Dharma, once just a thought, then a bunch of words on paper, was now a living, breathing reality. During this five-year building phase, we offered a limited number of programs. As word began to spread about the new retreat center being built in the mountains, interest grew, and increasing numbers of people started showing up and offering to help. So many people have given support and encouragement to this vision of a meditation center, this little jewel in the mountains, a place to study and to practice the dharma, a place to do the inner work that we all must do sooner or later. It is for this reason that Southern Dharma exists, and it is our hope that programs will continue to be offered that will help us to look at our thoughts, to understand the workings of our hearts and minds, and to realize, finally, what it means to be truly human.